India! We love your movies & your food! 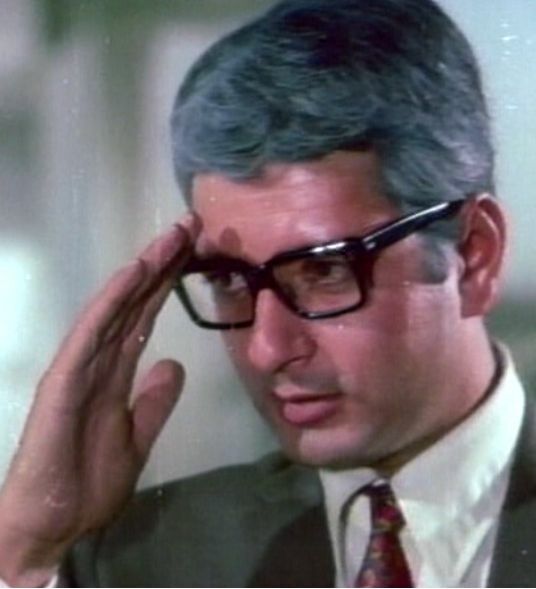 Sawan Bhadon is a campy 1970 Bollywood film reviewed cleverly and thoroughly over a The Hot Spot Online and Planet Bollybob. With the film already being so well reviewed, I’m simply here to add some screen images to show some of the fun. 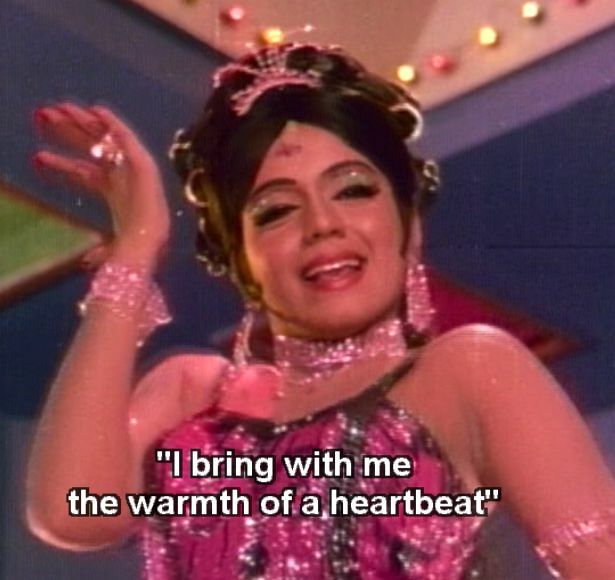 Within minutes of Sawan Badon starting, we see Jayshree T. as “Dolly” grooving around at a party, representing the evil influence of the West. Unfortunately, I couldn’t find a video of this song to add, but a full listing of the film’s songs along with the album cover can be found over at Music From The Third Floor. This dancing gets her noticed by an unsavory man who is ready to exploit her. 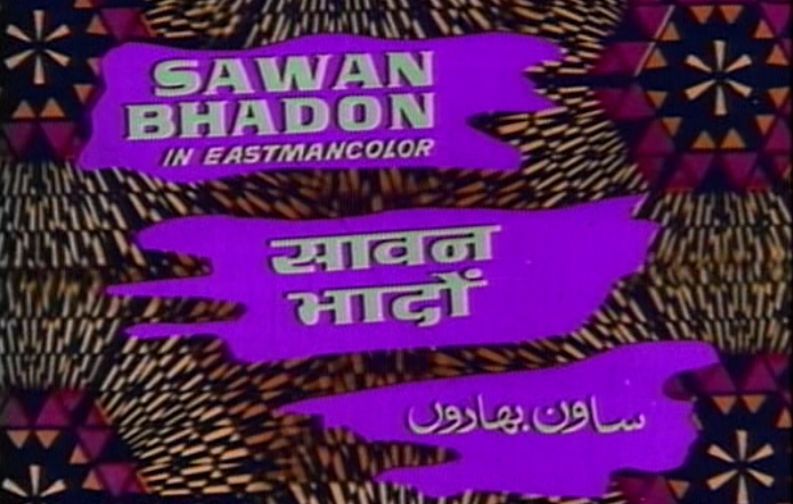 Sawan Bhadon is teenage Rekha’s debut film. She’s oh so sassy! Oh so spicy! Click HERE to see her picturized on playback singer Asha Bhosle’s Ik Dard Utha. 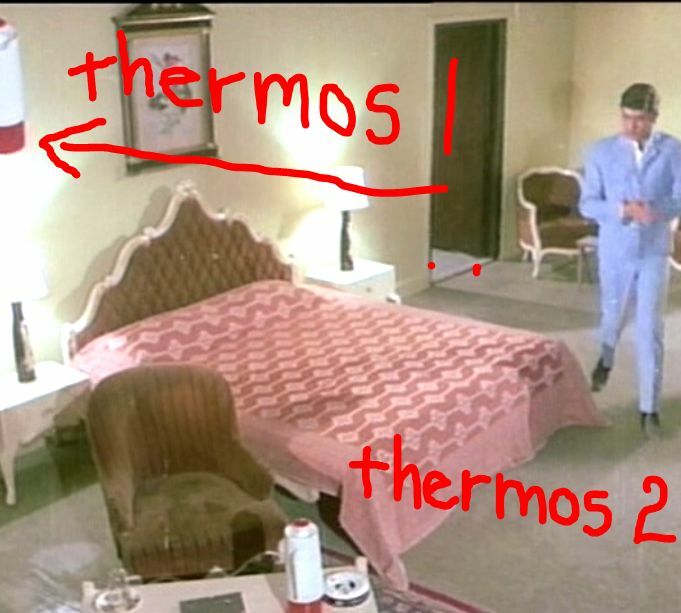 It was Planet BollyBob where I first read about The History of the Indian Movie Thermos. Sawan Bhadon has one of the most thrilling thermos plots ever. Finally, Sawan Bhadon has the Bollywood staple of one actor (Navin Nischol or Naveen Nishal if you prefer) playing two roles in the same film. 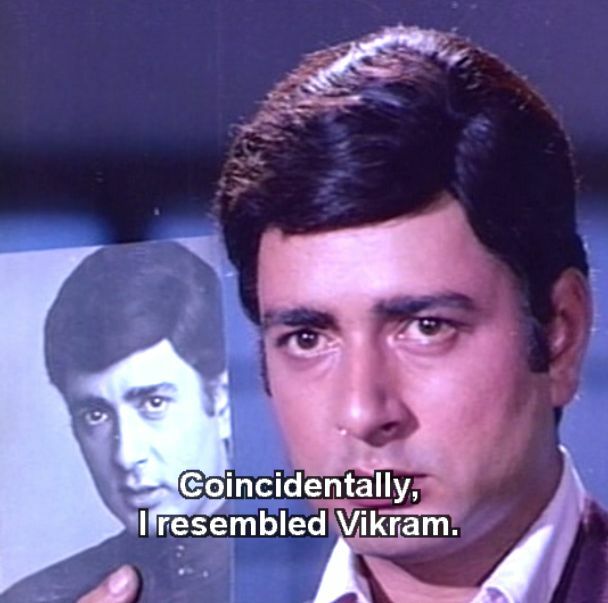 Is the Vinod or Vikram? Tomorrow I will continue to avoid work, shopping, holiday preparation, and responsible living and upload to rest of the pictures I screen captured of Jayshree T. from this film. Namaste! on December 10, 2008 at 1:36 am | Reply Richard S.
…And you can be sure I’ll take some time off from all the “responsible” things I should be doing if I have a chance to look at more pictures of Jayshree T.
Most peculiar eyebrows! The real ones are clearly showing beneath the pencilled in ones, with a wide gap between! 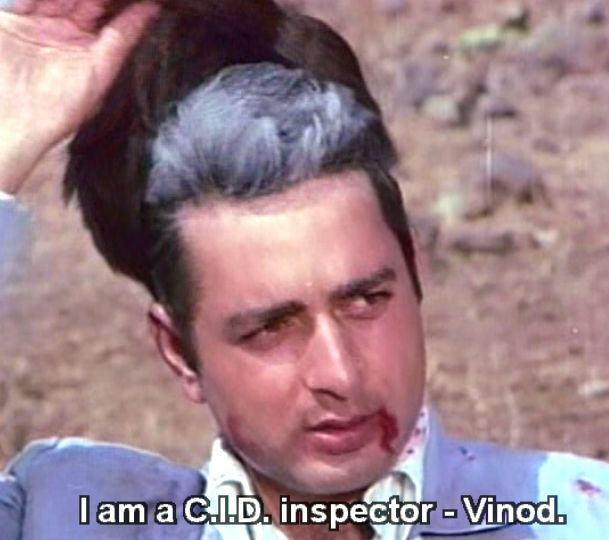 Inspector Vinod? Sounds familiar. ‘Explore World History with Inspector Vinod’ by Cutting Chai. That’s maybe where he got the name from. Very funny. Have you read any of it? I appreciate your support. 🙂 Thanks for joining the fun. Yes I has only scanned the Inspector Vinod section of cutting chai, I am more familiar with the learn Learn Hindi from Bollywood part of his blog and my favorite podcast being THIS ONE. Thanks for reminding me about the entire site though and now with this particular Inspector Vinod in my mind’s eye, it will be even more fun to read. And back to Jayshree T., the eyebrows under the eyebrows, disguised with sequins is so creative. You catch all the detail Joss! Heard so much about this, but never been able to get a hold of it- def sounds worthwhile tho- I shall look out for this one., thanks! Oh, wow, look at Rekha–such a baby and such a babe, all at once! 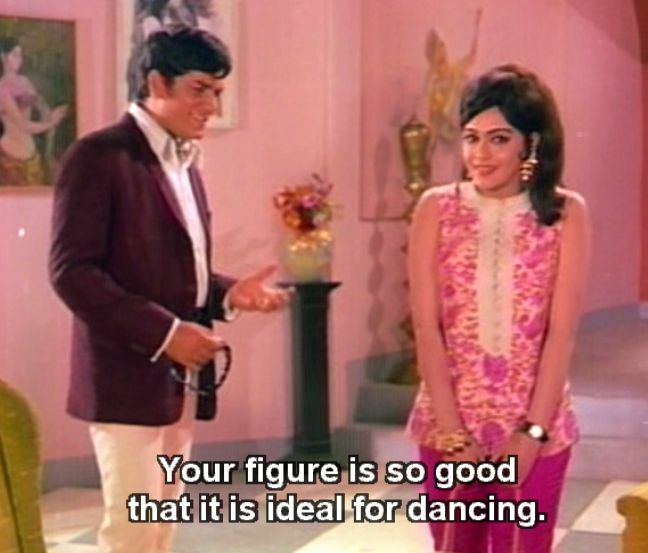 Of course, Jayshree T. is no slouch in the looks department, either. Thanks for all the pix! I got it thru Netflix. It’s not the best movie, but the camp appeal alone brought it to a solid 7/10 for me. Let me know what you think after you see it. Rekha was really cute in this. I’ve seen some of her other early movies, Namak Haraam (1973) comes to mind, and it’s hard to recognize her. She was a little butterball in the best possible way. For me this was more of Jayshree’s movie, since it was there first time I saw her act and not simply used as an item girl. Thanks for your visits dosto! I don’t think Jayshree T. was in either of the movies you mentioned. Here’s her Filmography HERE. 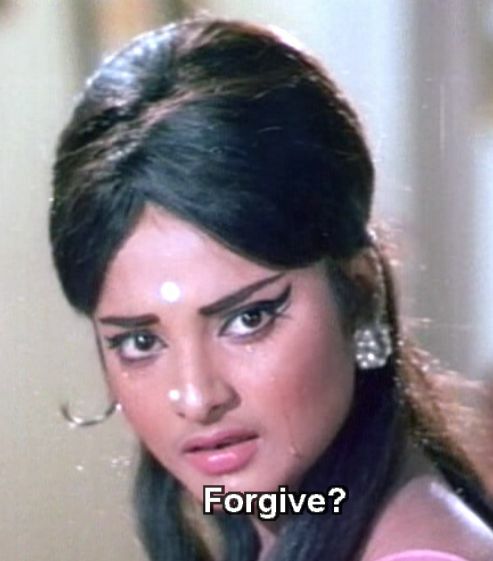 If you’ve seen Namak Haraam (1973) you’ll remember her from this image I posted HERE Too bad I can’t find the video of that song. And Tere Mere Sapne (1971) you’ll remember her from THIS. Here are some more examples of her work. I think I like her as much or even more than Helen. Thanks for your visit! As you may have noticed in this movie, Rekha’s natural complexion is dark tan but she later bleached herself to look a bit more fair – perhaps to cater to the needs of Bollywood in 70s and 80s? She also slimmed down considerably in her later movie. To the Anonymous above: It’s silly to assume a person had “bleached” their skin because it seems to you more fair now than before. Rekha seems have the same skin tone in that picture as she does now. Thanks for both of your visits and comments. Unfortunately, there probably is pressure to look certain ways for different parts. I know I’ve read about Rekha dieting and slimming down for roles later on. She looked fantastic in Sawan Bhadon, but of course youth and beauty often go hand in hand. It is too bad that movie industries worldwide seem to have those standards. I LOVE THAT! You know I’m obsessed when I see those similarities. Drives me wild! I am especially into the pool the has a staircase diving platform which spans the deep end of the pool that is seen in so many Bollywood films. Are you familiar with that? I will do a post on it soon as soon as I get a screen capture of it. Thanks for the image and your visit. 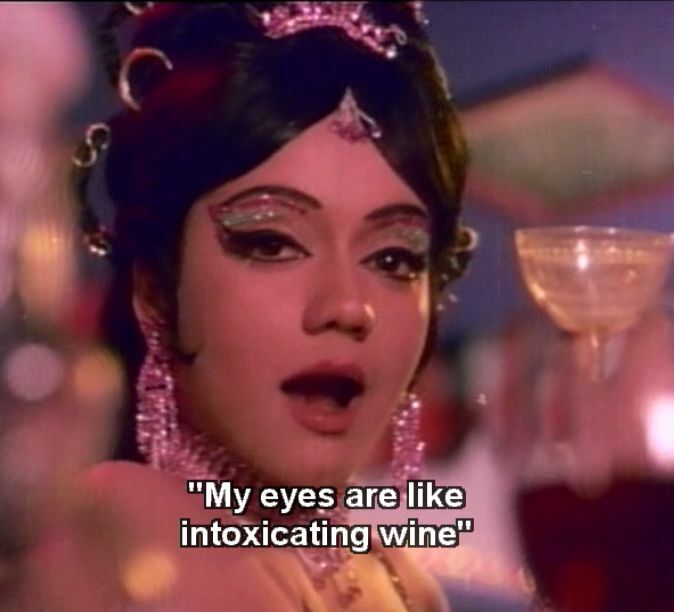 I must now watch Shankar Dada! those last pics of narendranath and jayshree t were the ones i talked about in my last post!…’sawan bhadon’ is a really good movie.. great plot,mind you navin nischal promised so much in this film its apity his career really did not take off!.. and yes rekha shed all the loads of flab to become a ” diva”… i remember she once said in an interview that during the making of sawan bhadon navin nischal derisively asked about her…” kaun hai yeh madrasan”? Yes, I know those were the same photos you spoke of. 🙂 When I selected them I had to be careful to choose some tame images of those 2 in their suits, since most of the frames were quite provocative. Yes, it was too bad that more never came of Nischal’s career. Clearly Rekha had that last word, considering her career in comparison to his. anyway she was gracious enough to act with navin nischol in ” aastha”… another bold movie!